Bazi, G.M., Mansour, E., Sebaaly, P., Ji, R., Garg, N., “Structural Performance of an Instrumented Flexible Pavement”. Transportation Research Board (TRB), Washington, D.C., 2019. Bazi, G.M., Gagnon, J., Sebaaly, P., Ullidtz, P., “Rayleigh Damping Effects on the Subgrade’s Apparent Non-Linearity”. Transportation Research Board (TRB), Washington, D.C., 2019. Bazi, G.M., Hajj, E., Ulloa-Calderon, A., Ullidtz, P., “Finite Element Modeling of the Rolling Resistance due to Pavement Deformation”. International Journal of Pavement Engineering, June 2018, DOI 10.1080/10298436.2018.1480778. Bazi, G.M., “Pavement Layer Seasonal Variations and Modular Ratios”. Invited Presentation by the Transportation Research Board (TRB) AFP50 Seasonal Climatic Effects on Transportation Infrastructure Committee. Washington, D.C., 2018. Bazi, G.M., Ullidtz, P., Sebaaly, P., Gagnon, J., ”Effects of Rayleigh Damping Parameters on the Subgrade’s Apparent Non-Linearity”. (1) Invited Presentation by the Transportation Research Board (TRB) AFD80 Pavement Structural Evaluation and Modeling Committee and (2) Presentation in Poster Session 388. Washington, D.C., 2018. Bazi, G.M., Saboundjian, S., Briggs, R., Ullidtz, P., “Bearing Capacity Assessment of a Flexible Pavement Subjected to Seasonal Effects”. Tenth International Conference on the Bearing Capacity of Roads, Railways and Airfields (BCRRA). Athens, Greece, 2017. Bazi, G.M., El Khoury, J. and Srour, F.J., “Integrating Data Collection Optimization into Pavement Management Systems”, Special Issue in Business and Information Systems Engineering, June 2017, Volume 59, Issue 3, pp. 135–146, DOI 10.1007/s12599-017-0466-4. Bazi, G.M., Hajj, E., Ulloa-Calderon, A., Ullidtz, P., “Finite Element Modeling of the Rolling Resistance due to Pavement Deformation”. Transportation Research Board (TRB), Washington, D.C., 2017. Bazi, G.M., Saboundjian, S., Briggs, R., Ullidtz, P., “Airfield Pavement Classification Number: A Mechanistic-Empirical Approach”. Transportation Research Board (TRB), Washington, D.C., 2017. Bazi, G.M., El Khoury, J., Srour, F.J., “A Practical Routing Model for Optimized Pavement Data Collection”. Transportation Research Board (TRB), Washington, D.C., 2016. Tohme, P., Ulloa, A., Bazi, G.M., Ullidtz, P., “Pavement Deformation Impact on Energy Loss and Vehicle Rolling Resistance”. Transportation Research Board (TRB), Washington, D.C., 2016. Bazi, G.M., “Enhanced Prediction of Vehicle Fuel Economy and Other Vehicle Operating Costs”. AFD80 Committee Meeting. Transportation Research Board (TRB), Washington, D.C., 2016. Bazi, G.M., Briggs, R., Saboundjian, S., Ullidtz, P., “Seasonal Effects on a Low-Volume Road Flexible Pavement”. In Transportation Research Record: Journal of the Transportation Research Board, No. 2510, Transportation Research Board of the National Academies, Washington, D.C., 2015, pp. 81-89. The paper was nominated for the K.B. Woods Award by the TRB AFB30 Low-Volume Roads committee. 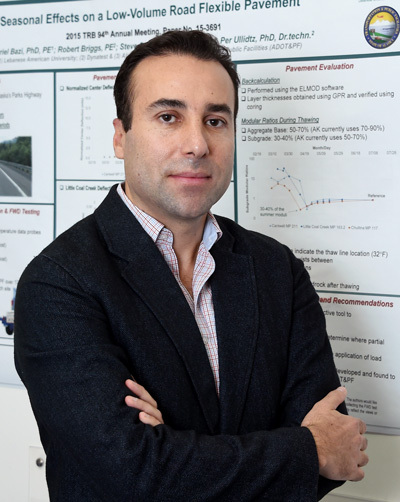 Bazi, G.M., Briggs, R., Saboundjian, S., Ullidtz, P., “Seasonal Effects on a Low-Volume Road Flexible Pavement”. Transportation Research Board (TRB), Washington, D.C., 2015. Asphalt Institute, “Asphalt Binder Testing Technician’s Manual for Specification Testing of Asphalt Binders”, Manual Series MS-25, First Edition 2007, Expert Technical Guidance Committee. Bazi, G.M., Sebaaly, P.E., Weitzel, D., Elicegui, M., “A laboratory Study of Construction Variability Impacts on Fatigue and Thermal Cracking Resistance of HMA Mixtures”, International Journal of Pavements, Volume 5(1-2-3), pp. 37-49, 2006. Maldonado, R., Falkiewicz, M., Bazi, G., and Grzybowski, K., “Asphalt Modification with Polyphosphoric Acid”, Proceedings of the 51st Annual Conference of the Canadian Technical Asphalt Association (CTAA), Charlottetwon, Prince Edward Island, November 2006 [Best Paper Prize]. Bazi, G.M., Hajj, E.Y, and Itani, A.M., “Analysis of R/C Decks in Multi-Cell Box Girder Bridges under Rational Wheel Load Distributions”, Bridge Structure, Vol. 1, No. 2, June 2005, 69 – 80, Taylor and Francis. Bazi, G.M., Sebaaly, P.E., et al, “Impact of Construction Variability on Rutting Resistance of HMA Mixtures”, Proceedings of the Transportation Research Board, Washington D.C., January 2005. Sebaaly, P.E., Ambroz, J., and Bazi, G.M., “Performance of HMA Overlays over Concrete Pavements in Nevada”, Proceedings of the Conference on Cracking in Pavements, Limoges, France, May 2004. Sebaaly, P.E, Bazi, G.M., et al, “Performance of Cold in Place Recycling in Nevada”, Transportation Research Record 1896, National Research Council, Washington D. C., 2004, pp. 162-169. Sebaaly, P.E, Bazi, G.M., et al, “Long Term Performance of Crumb Rubber Mixtures in Nevada”, Proceedings of the Asphalt Rubber 2003 Conference, Brazil, December 2003.